If you are looking for information on the PrintWear Xpress franchise business opportunity, PrintWear Express franchises or Print Wear Xpress franchising, then you have come to the right place. Want to help customers Create Their Identity? PrintWear Xpress is a retail-based concept that helps customers promote and Xpress their business, group, team, cause, event or themselves. We do this by offering the opportunity for customers to create customized and branded apparel through embroidery, screen printing and digital application methods. We also do this by offering a full range of innovative advertising specialty products specific to their promotional needs. Today, the promotional products industry, including wearables, is a dynamic $19 billion dollar business that continues to grow as the need for identity innovation increases. Who are our customers and why the dynamic growth in this field? The need to Xpress Yourself® has always been an American value, and PrintWear Xpress is well positioned to help customers fulfill that need. Business owner's purchase branded and logo applied items that include everything from pens, calendars and drinkware to daily business casual wear. Small to middle market companies in most locales represent a very broad and deep customer base that must market their businesses to get noticed. Likewise, educational systems are always promoting their institutions, athletics and overall school pride. Team sports for all age groups continue to grow and flourish in most communities. Almost every school, youth sport league or community center typically support multiple sports programs and desire a place to purchase their customized team apparel and spirit wear. Even hospitals and medical centers have the need to enhance and promote their image. At PrintWear Xpress, we believe first and foremost that we are in the business of solving needs, by helping customers build relationships, reward sales people and employees, and to build community. While there are a handful of brands that offer similar services in the marketplace, the wearables/promotional products industry is still highly fragmented. 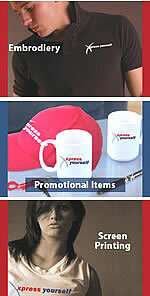 Only PrintWear Xpress combines a multifaceted approach to success in the field. SHOWROOM - Ours is convenient and customer friendly with an interactive "Idea Center" to help our customers truly understand their need. PROMOTIONAL CONSULTATION - We will train you to be a knowledgeable and creative consultant who can help build world class promotional programs and relationships for your customers. WEB STORES - We feature an interactive and customer focused internet presence that offers your customers the opportunity to review program ideas and products relevant to their promotional situation. Our website acts as a true portal to develop customer 'links' and 'relationships' with you and your local center. PrintWear Xpress centers are modern, attractive and well merchandised to help customers develop the right program for their needs. In store production is focused on garment embroidery, heat transfers and digital imaging utilizing equipment from industry leading vendors. These capabilities allow for quick customer order turnaround, while allowing our centers to focus on growing and nurturing their customer base. At PrintWear Xpress, we focus on the customer's overall experience, education and ultimate satisfaction. PrintWear Xpress centers are generally located in neighborhood strip centers that do not require an anchor tenant. As a result, our 1,200 square foot retail locations are not burdened with rent structures inherent to traditional anchored centers. A trade area with a solid mix of businesses is also desirable. The main purpose of our location selection is to find a convenient site for our customer showroom and to drive brand exposure in the community. How will you help me to grow and nurture my business? TRAINING - Comprehensive multi-week program, focused on sales programs focused on solving customer promotional needs. SITE SELECTION - Focused on finding the right location with lease economics for success. PRODUCTION - Automated production equipment from reputable industry vendors. STORE PACKAGE - Innovative and inclusive store build-out program and construction services. MARKETING - Ongoing support to help you grow your business built around sales programs focused on long term customer retention. TECHNOLOGY - Support of an evolving and robust web presence to help build and leverage your customer base. SUPPORT - A world class franchisor who leverages technology, communication tools and innovation to help you focus on growing your business.